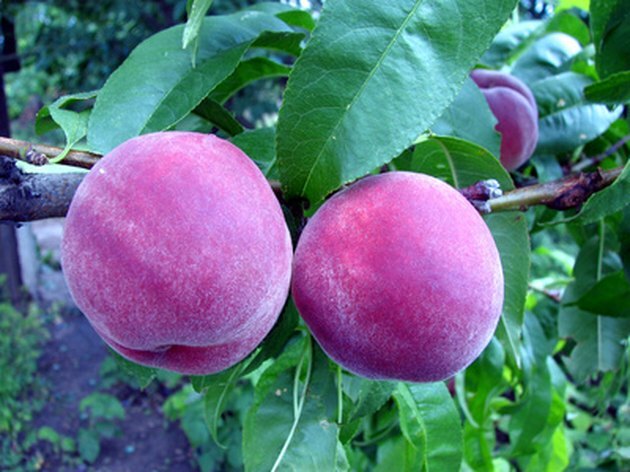 Peach trees are self-compatible, meaning that you don't have to plant several trees to harvest fruit. A single tree will produce peaches by itself. If you want to grow bigger peaches, plant the right cultivar. According to Rutgers University, June Lady, May Crest and Elegant Lady are three that produce larger fruit than average. If you want to increase the size of the peaches on an existing tree, you must carefully heed its moisture, light, pruning and nutritional requirements. Grow bigger, more succulent peaches. Keep the soil around peach trees rich, well-drained and weed-free. Amend clay soils with equal parts peat and sand to improve drainage. Peach trees will not thrive in waterlogged soil, and will produce small fruit or no fruit at all. Make sure peach trees have adequate shelter from cold winds. Their thin bark is susceptible to injury, especially in winter. 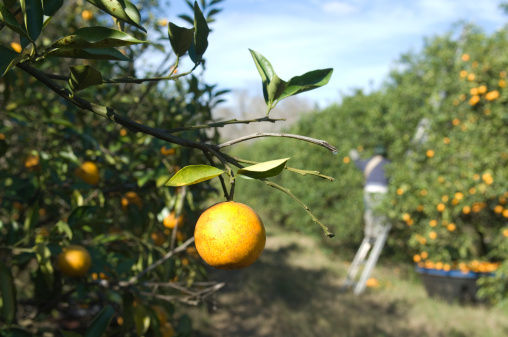 Fertilize peach trees once a month during the growing season with a granular fertilizer that contains nitrogen and potassium. Sprinkle the fertilizer in a circle around the tree, extending out to the drip line of the branches. Water it in thoroughly so the nutrients will leach down to the roots. Prune vertically growing shoots in the canopy of your peach trees with pruning shears in summer. Removing this vigorous foliage will allow light to penetrate the canopy, ripening fruit on the inside of the tree and helping it grow bigger. Water frequently and deeply during the last six weeks before harvest. Peaches develop rapidly during this period, and increased water will cause the fruit to swell and grow bigger. Thin fruit as it develops. The ideal ratio is 35 to 40 leaves per fruit to get the biggest fruit possible. Pick off green fruit to achieve this proportion.